Mark your calendars - we're headed to Washington DC in May! It's time to make your hotel reservations and travel arrangements. We have secured a block of rooms and have a full schedule of activities planned. Information on the reunion can found on our SPECIAL REUNION PAGE. Jim passed away on January 11, 2018 surrounded by family. He had been suffering from Alzheimers and was in a care facility in Colorado Springs. Jim and Marie attended our reunions in Des Moines, Tucson, and Albuquerque. Jim's wife Marie came to Denver to join us in 2017. 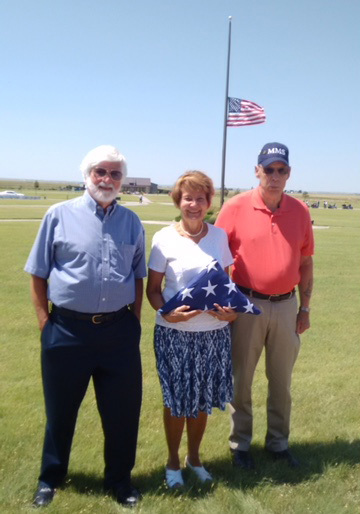 Jim was laid to rest on July 10th at the VA Cemetery east of Alliance, NE. Photo at right shows Marie Jenkins holding the flag from Jim's funeral. 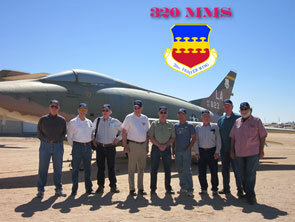 Representing the 320th MMS were Steve Linebarger on the left and Paul Baker on the right. Paul Baker reports that Buzz Simpson passed away on April 22, 2013 at age 81. He had retired from the Air Force in 1968, married and eventually settled in Paradise, CA. Click here to view his obituary. Sam Bothern reports that Gary Gebhardt passed away on May 24, 2003 at age 54. He was a 462 in weapons release, arrived in 69 and went to Upper Heyford when Wethersfield closed. Click here to view his obituary. Ken Fleeman heard from Ann Koulik, Ed Koulik's daughter that Ed passed away this on September 14, 2014. Click here to view Ed's obituary. Jerry passed away on May 28, 2014 following surgery. He was in the 320th from 1966-69. He was retired from the Air Force and living in Louisiana at the time of his death. Troy Dobbs passed away on May 18, 2014. Troy went into surgery on April 7th and was in rehabilitation on April 16 when he started having problems. He was rushed to the emergency room but his condition deteriorated and he passed away a short time later. Click here to view Troy's obituary. Tom "Chip" Monk passed away in 2004. Barbara Dobbs was searching for missing members and found an obituary for Chip, and subsequently confirmed this with the family. Chip lived in Klamath Falls, Oregon following the Air Force. He passed away in 2004 after a five year battle with cancer. 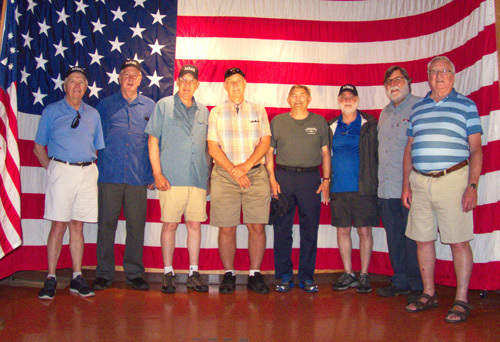 Eight veterans of the 320th MMS joined up in San Antonio from May 10-13 for our 2018 reunion. Activities included a visit to Lackland AFB, a tour of the Alamo, a cruise on the river, exploring the River Walk and a tour of the Briscoe Western Art museum. A good time was had by all, and we hope to announce our next reunion soon! Click here to view our reunion gallery page. Just in case any one is interested, I have access to USAF historical record cards on MOST ALL aircraft. So if you have a favorite aircraft that you want the history of, I may be able to get it for you. Just give me the type and FULL serial number. The history will only give the date and place of manufactor, the cost, all units of assignment, and final disposition. It will NOT give you the COMBAT record. Herb Harper, NCOIC weapons release & gun shop, 1969-70. Webmaster's note: You can get Herb's e-mail address by logging in to the member area. RAF Wethersfield is currently a Ministry of Defence facility. It is the headquarters of the Ministry of Defence Police (MDP), which is a civilian police force within the Ministry of Defence. 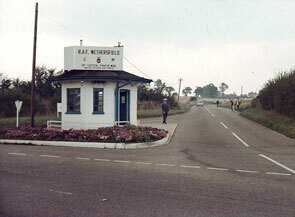 To visit the base, you will need to make arrangements through the Wethersfield Airfield Museum. The museum is currently open on the 3rd Sunday of the Month between April and October.